and its arid northern coast, which boasts an incongruous but vibrant surf scene. 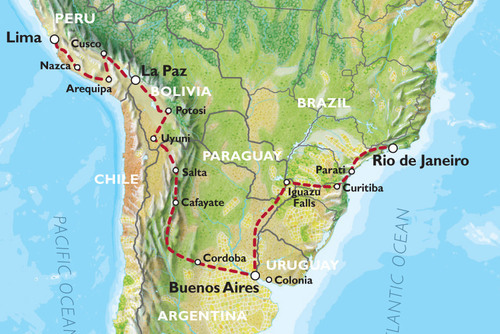 After Lima, follow the Andes, taking in its towering peaks, ancient Incan archaeological sites including Machu Picchu, the vast altiplano of Bolivia and its eerie yet majestic Salt Flats, and its complex and mysterious indigenous cultures, finish in Santiago with the snow-capped Andes as the city's backdrop. 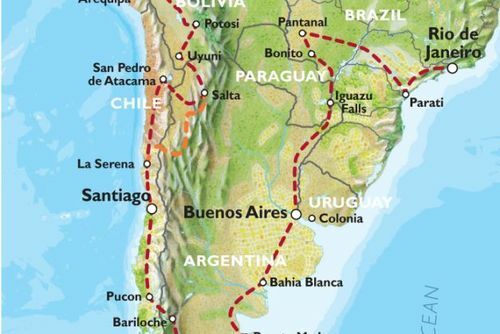 Throw in a few adrenaline activities, like sandboarding in the Peruvian desert, the wine country of northern Argentina, some bustling colonial towns, and cosmopolitan cities with great bars and restaurants and you've got a varied and packed adventure that gives you a genuine taste of South America! Starting our South America tour in Quito we cross the Equator on our way to the town of Otavalo famous for its colourful craft market. Heading east on narrow, tortuous roads to the steamy edge of the Amazon basin and our gateway into the Amazon jungle. Here accompanied by experienced guides, we explore on foot this exotic environment. Further south, perched high in the mountains of Ecuador, lies the outdoors mecca of Banos. This spa town, where Ecuadorians go to relax in the thermal baths is ideal to hike or mountain bike the various trails to one of the surrounding waterfalls or the impressive nearby rocky canyon, is a favourite amongst those who have undertaken South America travel. 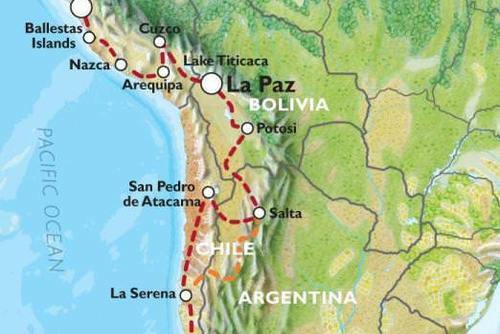 We hit the road again and drive south along the spine of the Andes towards Peru visiting Cuenca on the way. 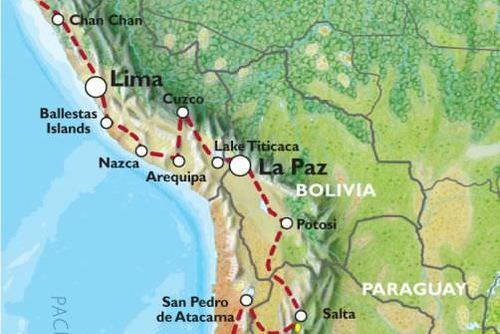 A days drive on the Pan-American highway brings us to the border with Peru. You will notice an amazing transition in one day, from the good farming country of highland Ecuador, through sub-tropical forest and immense banana plantations, to dry barren desert in Peru. We are rewarded with a couple of days chilling by the beach. Our next stops on our South America travel experience are the Chan Chan ruins, imperial citadel of the pre-Inca Chimu kings which the Incas later conquered. It claims to be the largest mud brick city in the world. Continuing with the Andes close to our left and the sea on our right, the capital city of Lima will be our next stop on the Andes & Amazon South America tour.Here you'll encounter both abundant wealth and grinding poverty, modern skyscrapers next to some of the finest museums and historical monuments in Latin America. Departing Lima our next stop is the Ballestas Islands in the Paracas National Reserve. By boat we visit the rare and exotic sea birds and mammals that inhabit these islands. An hours drive inland in the heart of the Ica Desert is Peru's main wine centre. 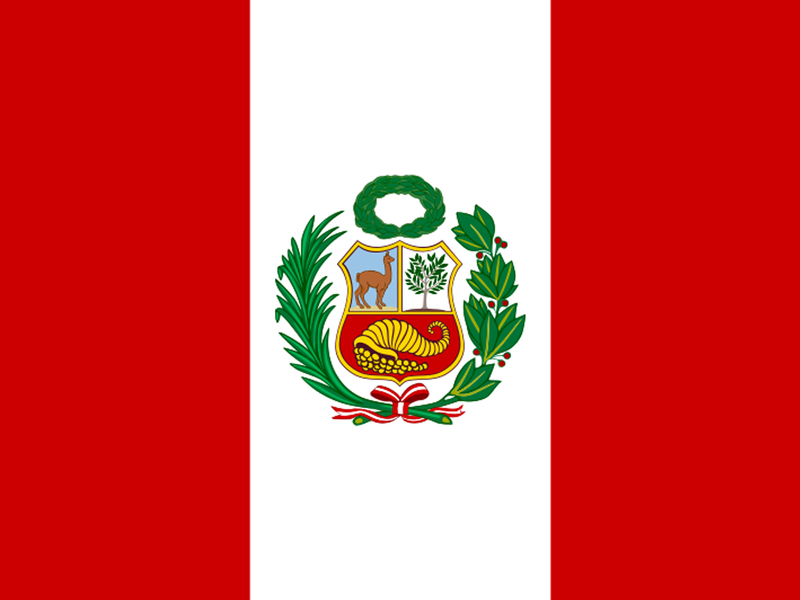 Here, if time allows, we will visit a local winery and try Peru's national drink, Pisco. Next stop is the Oasis of Huacachina. A palm fringed lake surrounded by impressive sand dunes, you can relax on the beach, go for a swim & then if its an adrenaline rush you have the option to head out on a custom made dune buggy & roar across the desert sands to the top of enormous dunes & then sand board down them - imagine snowboarding but on sand instead! Then, after an unforgettable desert sunset, we sit around the campfire while our guides cook up a storm, followed by a night sleeping out under the stars. In the morning we make our way to one of the world's great archaeological mysteries The Nazca Lines. These huge figures and shapes, carved into the desert floor are best viewed from the air - South America travel is not complete until you have seen these unbelievable ancient mysteries. Still heading south we visit Chauchilla Cemetery with its well-preserved mummies, on our way to Puerto Inca, at this ancient Inca harbour we camp at the beach and enjoy our last night at sea level before beginning our climb back into the towering Andes. The next two nights are spent in Arequipa at 2325m, giving us time to acclimatise, and enjoy this beautiful colonial city with its impressive El Misti Volcano in the background. Arequipa is also the gateway to one of the deepest canyons in the world. Twice as deep as the Grand Canyon, Colca Canyon is an awesome sight. Here, if you get up early, Condors can be seen circling lazily on the thermals rising from the canyon floor. We now have to face one of the most arduous and punishing dirt roads on the tour, although we soon arrive at Cuzco. Widely considered to be the most interesting city for South America travel, Cuzco is surrounded by the Sacred Valley of the Incas and offers a wide range of activities to explore the region. 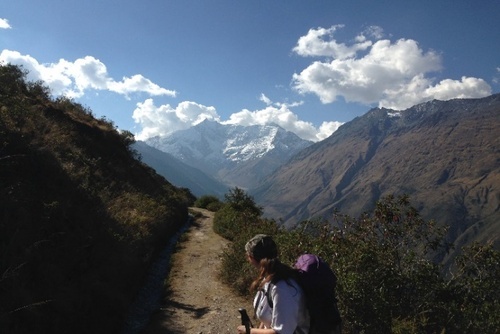 We will base ourselves here for 6 days giving us enough time for the Inca Trail trip, which is regarded by many to be the highlight of their South America tour. When permits are still available, we will organise the Classic Trail trek, but great alternative treks can be arranged when the Classic is not available or by your choice (must be pre-arranged at time of booking). 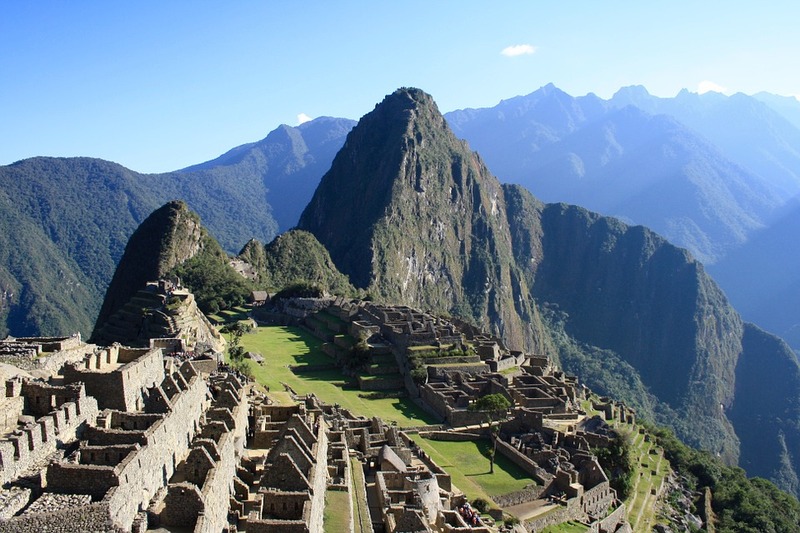 These alternatives mean that you still get to visit Machu Picchu. Tours to Machu Picchu are absolutely unbelievable; a trip to this City in the Clouds is an ancient and awe-inspiring part of our South America travel tour. Besides seeing Machu Picchu, you're able to enjoy the architectural uniqueness of Cuzco and explore some of the colourful surrounding markets. Please note that for all those visiting Machu Picchu there is now the option to buy a ticket to go up the summit next to Machu Picchu, Huanapichu. Tickets for this must be requested at the time of your booking with us, and payment made in advance in the UK. 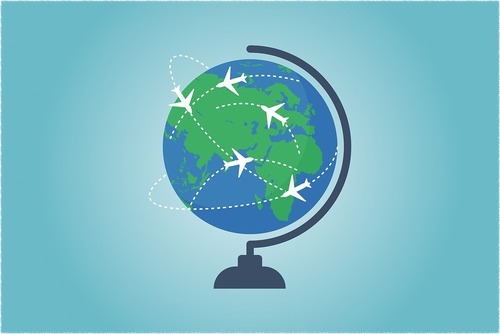 Please see the section 'Volunteer Projects and trip Add-Ons' from the 'Overland Trips' tab on our homepage for more details. You will have the option to add the tickets to go up Huanapicchu when you make your booking online, be sure to add them if you would like them. Bordering Peru and Bolivia at 3800m lies Lake Titicaca, the home of the Uros Indians who have made their dwellings on floating reed islands. By boat we visit the floating islands during the day and then we go that one step beyond the average tourist and spend the night with one of the Indian families on the lesser known islands Isla Amantani or Taquile. Spending some time during South America travel in these local communities will provide a unique opportunity to learn more about the traditional lifestyle of the Andean people and their customs. 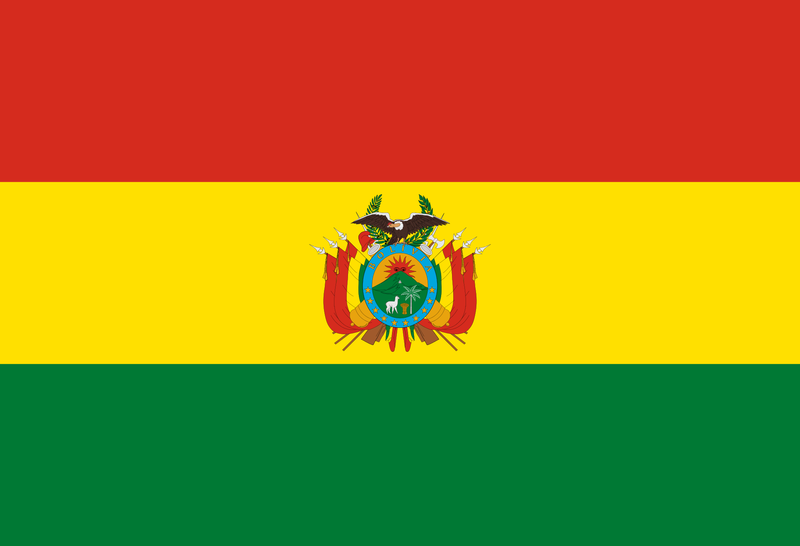 From here it is a days drive to the capital of Bolivia - La Paz. This is a great place to visit a 'pena' club, dedicated to Andean folk music, and perhaps buy some souvenirs in one of the authentic markets such as the witches market. 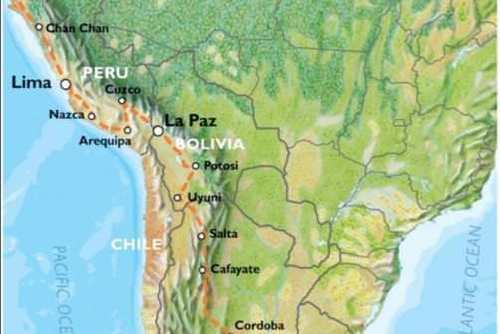 Leaving La Paz we enter real Bolivia, where the Aymara and Quechua Indians scrape a living from their small plots of land in the harsh climate and paved roads are virtually non-existent. A days drive brings us to Potosi. At over 4000m it is the highest city of its size in the world and 400 years ago it was the largest city in all the Americas. Vast amounts of silver were extracted from Potosi and shipped to Spain in years gone by. 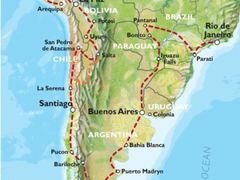 The adventurous who have undertaken South American travel will appreciate the opportunity to go down one of these mines where mining techniques have remained unchanged for centuries. Visiting the ancient mint or having a tour around the Casa Nacional de Moneda (National Money House) also provides a good look into Potosi's and Bolivia's past. Leaving the bleak Altiplano we arrive at the shimmering white Salt Flats of Uyuni. It is possible to venture out into the salt lakes for a 1 day excursion. With no roads and only vague tracks to follow it makes for an unforgettable experience. Our descent through the Andean passes is spectacular as we cross into Argentina towards the colonial city of Salta where we have a couple of free days. After Salta, we head south winding around lakes and weaving through baked cliffs until we reach Cafayate, the first wine region of Argentina. Famous for its white wines, you can explore some of the wineries on foot or by bicycle. 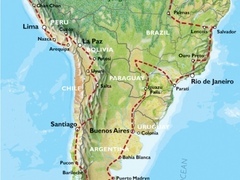 Continuing south we join the route 40, the longest route in Argentina, to Mendoza, the biggest wine region in Argentina. Here you can indulge in more wine and good steak! From here we head for Chile as we cross the Andes past the Inca Bridge and San Martin's pass and into the modern capital, Santiago. Have you booked with Oasis Overland? Please share your experience and submit your review.